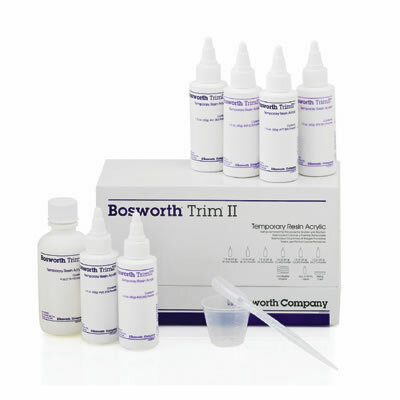 Bosworth offers Trim and Trim II, fast-setting nonirritating PEMA temporary crown and bridge materials formulated for extended use. The powder and liquid in each kit are identical in formula, and the powders can be mixed to obtain specialty colors. Trim is available in 2 shades (light and dark); Trim II is available in 6 shades for excellent diversity in achieving the perfect shade match.